Each year, thousands of college faculty, technology professionals, and educational leaders gather at EDUCAUSE to explore the biggest trends and issues impacting higher education today. The 2018 EDUCAUSE Annual Conference is one of the most informative and inspiring educational events of the year, and we’re pleased to be a sponsor. At this year’s conference, we’re taking a deep dive into some of the emerging factors that contribute to improving learning outcomes, making course materials less costly, and unlocking student success. 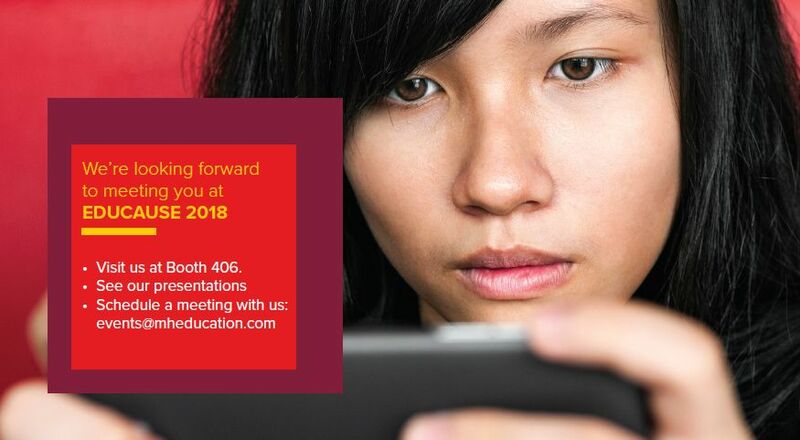 Visit the McGraw-Hill Higher Education team in exhibit hall booth #406 to see how we're making it possible. Overview: Three learning scientists from McGraw-Hill review the latest research literature and give practical guidance on designing learning environments to support both the cognitive and noncognitive factors that contribute to learner success. Overview: Learn how Colorado State University is partnering with providers of third-party tools to advance the use of big-data and predictive analytics to help monitor and improve outcomes for all learners. Overview: In just a few years since they were first introduced, inclusive access programs are dramatically shifting the way students access and use new course materials. Learn how collegiate institutions are effectively applying this new digitally-driven textbook purchase model to save students money and help improve course retention and pass rates.